After searching for clues and for Wi-Fi, I finally found the piano song I first heard as a seven-year-old performing in The Little Prince. For a second, I was no longer in Paris's 8th arrondissement, but backstage in my St. Paul elementary school gym as the song led us through a scene change. It was everything I remembered, with simple, soft opening keys answered back by restless loud ones. I had forgotten just how angry the answering notes were. In my memory, the song had lost its rhythm and played however I wanted it to. I was delighted to learn that it was meant to be like that, having been written in free time without a time signature. Who wrote it? Erik Satie. The title of the piece: Gnossienne No. 1. Born on May 17, 1866, the French composer would have turned 150 years old just last month. Satie lived in Montmartre in his early 20s, going to the neighborhood's cafes and making friends with the likes of Claude Debussy. Then Parisian life became too expensive. He moved a few kilometers away to Arcueil, France, where he lived for the rest of his life. I grabbed my metro map. I knew it could be the only time in my life when I can read about a composer who lived in a Paris suburb and then be able to walk outside, hop on a train, and be there in 30 minutes — so I did just that. Umbrella and earbuds in hand, I took the RER B south to Arcueil. 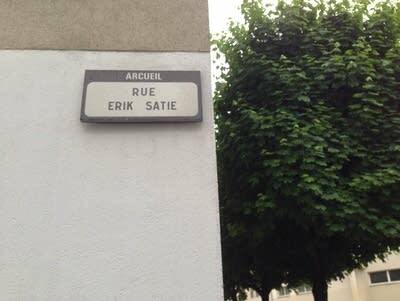 I scaled the sloping streets and found Rue Erik Satie, a tiny street hedged by gray apartment buildings. The neighborhood was all concrete and asphalt. After playing at cabarets, the composer would walk the long way back to the industrial suburb with a hammer in his pocket for protection. Irritable and intriguing, Satie wore the same gray velvet suits for decades, created a church of which he was the only member, and ate exclusively white foods. He found a following later in life, playing a role in Paris's avant-garde scene and collaborating with Pablo Picasso. He had only one romantic relationship, with artist Suzanne Valadon. 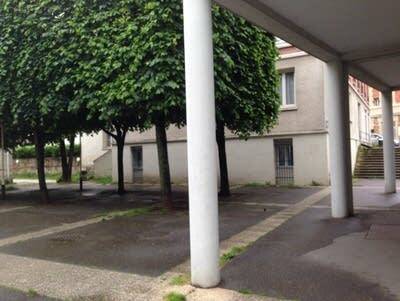 In Arcueil, he took no visitors. When his friends opened up his room after his death, the place was filthy and full of little other than papers and junk. 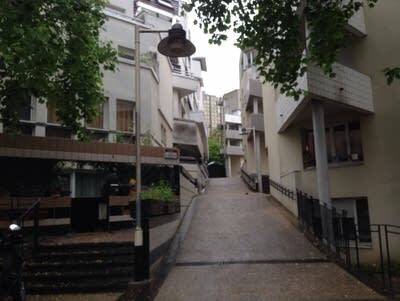 The composer might not have led a cozy life in Arcueil, but the town preserves his presence. 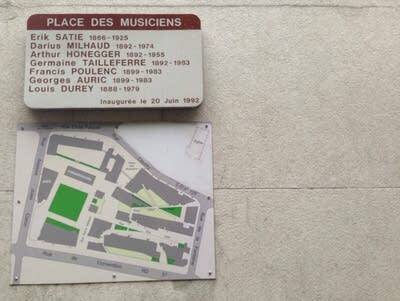 I stumbled on a square called Place des Musiciens, which lists his name on a wall. 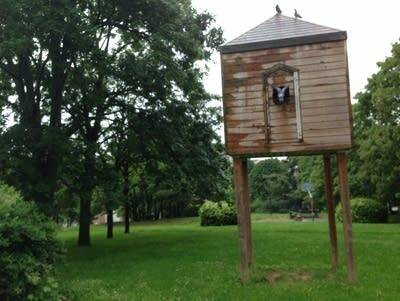 Walking up a hill, I found Parc Eric Satie, an oval green space with a soccer court and a pigeon house. 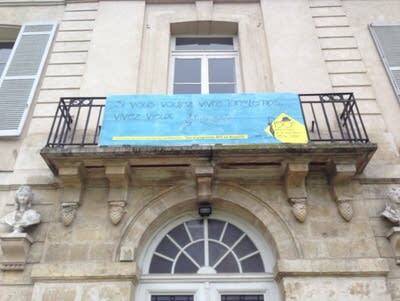 A blue banner hung from a building advertising his recent birthday celebration, quoting his well-known words: "Si vous voulez vivre longtemps, vivez vieux (If you want to live long, live old)." With Satie's notes no longer just in my head, but in my ears, I realized that the music has stayed in my memory far longer than any line of dialogue I had been relieved to remember at the time. Music lasts, just like relics of a kooky composer in a town I otherwise never would have visited. I owe my drama teacher a thank you. Hailey Colwell is a St.-Paul-bred writer and recent University of Minnesota graduate who is currently living in Paris. You can read about her experiences as a Minnesotan in Paris on her blog, Des Mots du Monde.